The music evening had a theme of water, water everywhere. Clyde were the first house up to sing & they sang Bridge over Troubled Water as their choice. Every house had to sing a Welsh song called Calon Lan. The words were very difficult to learn, as they were in Welsh, & I thought Clyde sang that song the best of any of the 4 houses. 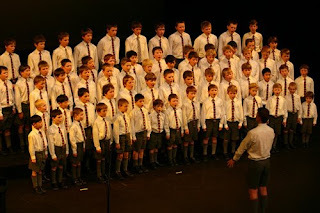 However Hamilton house did a wonderful rendition of Sloop John B & they won the house singing competition.